The Art of Photographing Birds is more than equipment, exposure and location. Each of this items is required, but will not guarantee a memorable photograph. In general, photography is more than the sum of the equipment used. It is the vision of the photographer. The equipment is the tools to manifest the vision into a photographic image. 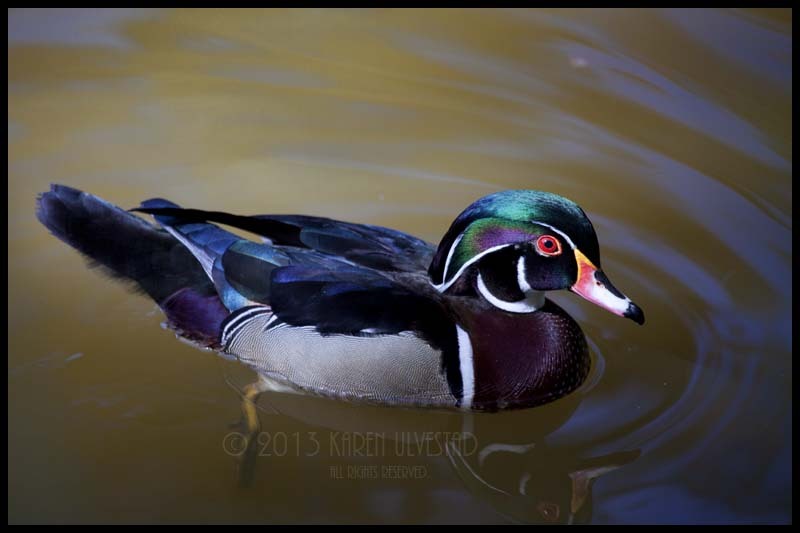 The image below is a male Wood Duck. The sunlight enhances their color, and makes them brilliant. It’s in the details that make the difference between a good photograph and a “wow” image. This photo shows how I saw the duck, as he was swimming in the pond. Another photographer may have seen his colors differently. Often, I get asked “how close are you to the bird?” or “how long is your lens?” My longest lens is a 100-400mm with image stabilization. So, that means that I need to get relatively close to the birds, or crop a lot out of the image. The photos above and below are un-cropped. The last photo was cropped a little to bring the focus to the owl, instead of the shapes of the branches. I was about 25-30 feet from the owl. So, how do I get close to birds? There are several factors that contribute. The first and most important is myself. Am I looking like a predator? Or, am I appearing non-threatening and/or part of the environment? All three of these birds are wild. To approach these birds, I need to feel calm and peaceful. If I’m distracted by “life things”, I cannot get close enough to take photos like these. Wild birds and animals are sensitive to their environment, and always looking for the “threat” to their existence. Rule #1 = Be calm, quiet and peaceful. 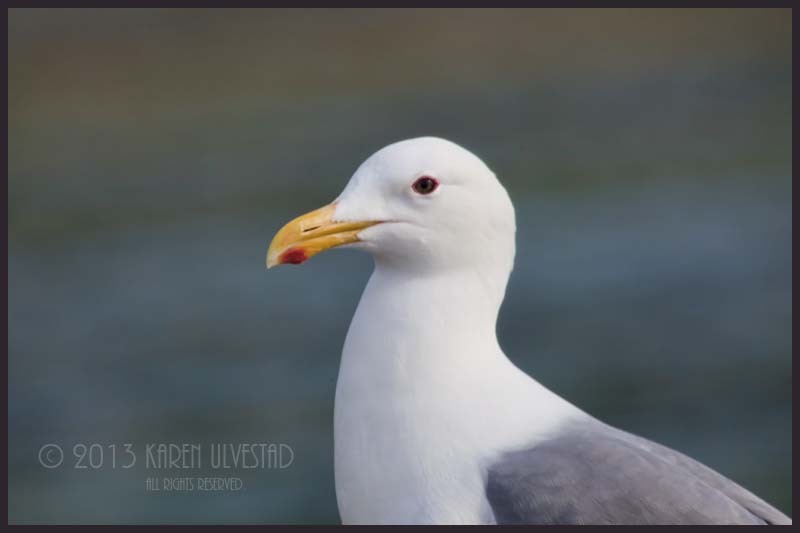 The gull photo above was taken at a local beach. Most of these birds are opportunist, though very cautious. Some people who visit this beach will chase the gulls and other birds, which makes them wary of humans. Further down the beach is a resting/feeding area for migratory birds. Unfortunately, some people think it’s ok to allow their dogs to chase the feeding/bathing birds, and have the impression the birds “like” being chased. So, when we go to photograph the birds, they are very skittish of humans. Rule #2 = Earn the trust of the birds. 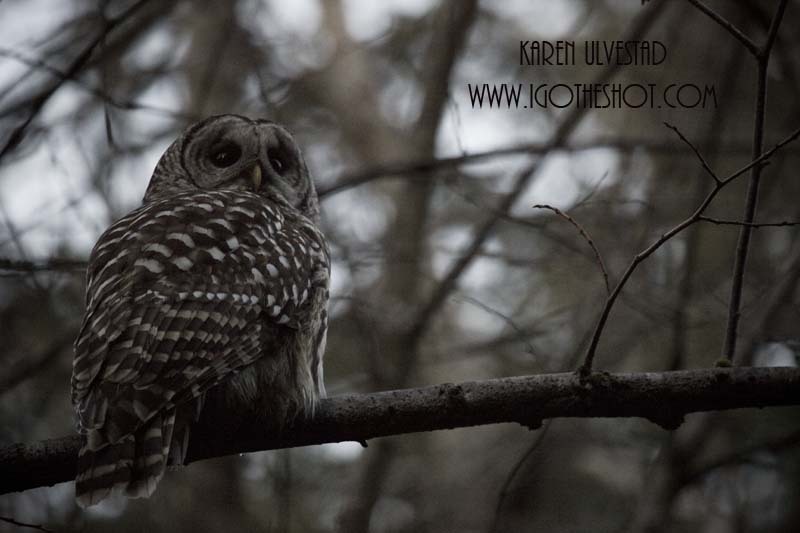 The Barred Owl photo below was taken at dusk. Being up in a tree, the owl is less wary of people, and focusing on hunting. He stayed for a few moments, then flew off to find food. For more tips and techniques, check-out one of my up-coming workshops at Sitka Center on the Oregon Coast or Pacific Northwest Art Center on Whidbey Island. Great post, addresses the “questions” and answers them in a no nonsense straight forward manner. “Thank you!” Oh and let me not forget, the Barred Owl is perfect in every way…fantastic photo!